I recently met with Coach Helen Williams to discuss post defense and other topics. I have known Coach Helen for a few years and have read her book Coach Like a Mother: A Guide for the 21st Century Sports Coach, which I would recommend for any coach (especially those at the youth level). I have seen her coaching at the drills and skills practices for the AAU Evolution program and she can communicate the game from the youth level up to the college level where she is a former coach. 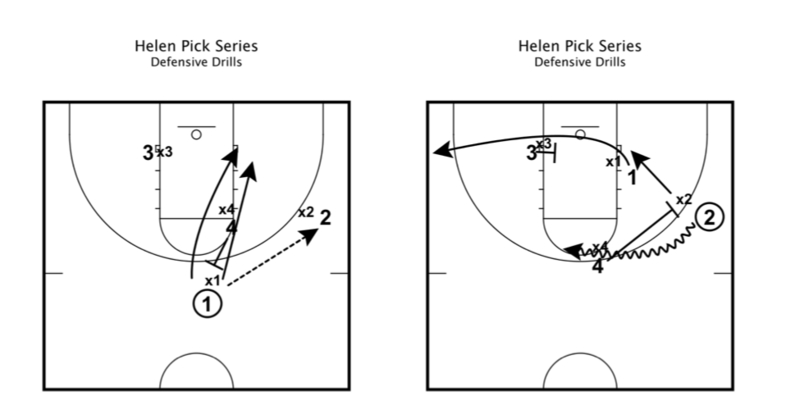 I asked Coach Helen for her philosophy on post defense, how to be transparent in giving player’s feedback, and some of her unique ways to running practices. Coach Helen had two main philosophies on post defense. First, like most everything she did as a coach she wanted the job to be simple so players had to think as little as possible. Second, and more specific to post defense, deny the ball from ever getting to the post in the first place. To deny post touches a post defender would have four jobs. Win the race to get your feet on the block. If the offense catches it on the block, that player now has the option of going either left or right to get to the rim. Assuming the offensive player has to start below the block, the job is essentially done because the post entry pass will most likely be caught at an impossible angle to shoot. Maintain consistent contact with the player throughout the possession. Coach Helen emphasized that she wanted players to maintain a small triangle of space that they always stayed in contact with the player which incorporated the two blocks and the high post as the ball get moved around the perimeter. In keeping contact with the player, a post defender did not have to guess when the offense moved and could therefore always stay a step ahead in getting to the spot that the offense wanted (the block). Never sacrifice the spot that you won. Whether the offense had the ball or not, Coach Helen stressed that the offense must go east and west. Post defenders could not settle for just winning the spot initially – they needed to sustain it throughout the possession. Moving north and south for the offensive player meant going through the chest of the defender for what should be an offensive foul. Bump the forward running in transition before the player gets to the post. It was an insightful comment because posts are of course trained to run to the rim, and I of course have never spoken of this to the defenses I coach. The ball will inevitably make it into the post. Coach Helen acknowledged as much, “It’s not over when they catch the ball.” Again the east/west idea was a point of emphasis as well as the potential for sending an extra defender to the ball. Extra defenders were welcomed, but there needs to be a plan to recover on the vacant player. Either the person choking that pass needs to make the return pass to their player slower or there is some type of perimeter rotation. Everything has its contingencies that make this extra step harder to practice and execute in a game (two players in the post, what players are shooters and what are not, etc. ), which is why it was all the more important that the ball never got to the post in the first place. In the event that a team is killing you in the post, it begs the question do we change what we do? That depends. Are they beating you, or are you beating you? Coach Helen said in a timeout situation in which it was time to reevaluate she always left room for a Plan B, but she also made sure players were accountable first. Certain players (i.e. seniors, leaders) could have latitude to make suggestions, but if they were going to change what they typically practiced it had better work or they would go back to her way. There were also those occasions where the players were doing what they were supposed to and the offense was just better and able to make the plays anyway. Sometimes it is not your night. I was watching film of my own team recently – looking specifically at possessions in which we had given up a hoop. The number of repeated mistakes had me convinced that these clips should be shown to the team in the fall. I recently wrote after reading Ray Dalio’s book that there is nothing worse than denying your weaknesses. The conundrum is the manner in which these errors are communicated. I asked Coach Helen about being transparent with players. Her immediate response was something to the effect of players need to know that not everything is going to go their way, they are far from perfect, and they need to get over it. Of course that cannot be the everyday answer to managing players, and Coach Helen offered ways to try to build the relationship. Open ended questions were a way of getting players to be reflective, give them confidence in making decisions, and eventually give your own take as the coach on the situation. Quite often in my own experience of asking players open-ended questions they are much harder on themselves than I would have been. Other times, players miss the mark on what I’m trying to get them to see. Coach Helen’s phrase that stuck with me for combatting this was, “You know what that’s not a bad idea, but…” rather than completely dismissing the player’s thoughts. In the end, the degree to which transparency can lead to success comes back to trust. Good relationships and previously experienced teachable moments help lead to a willingness to change. “Heat of the moment” situations in which reflection is not an option are also situations which will benefit from a positive track record with player/coach. That said, players will want to know why something was done, so the coach should explain. When players know why something is done their IQ gets stronger and they can apply that lesson or principle in the future. I always try to ask coaches for things that they do that they believe other coaches do not do that could easily be incorporated. Coach Helen offered three ideas that deal on some level with improving practices. 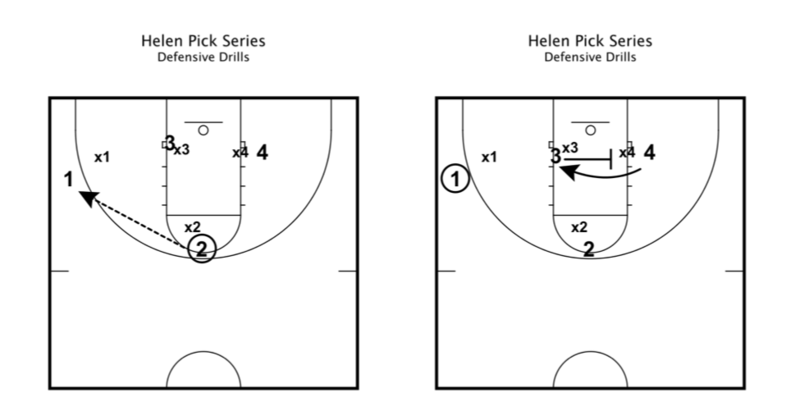 The first is a defensive drill that she used with high frequency with her team at Merrimack College among other places. It forced players to react to numerous types of screens in a short window of time. The exact sequence might not be exactly what she would run (you could add your own iterations of flair screens, flex screens, etc. ), but the idea is that by doing this as a daily exercise, your team is being exposed to virtually any type of screen that they could face throughout the season. As an added bonus, the offense is moving the all and learning the difference between setting a pick and going through the motions. Philosophically, Coach Helen liked to put the clock on everything that was done at practice. She tried to make the pace of practices match the pace of games. As part of this water breaks were not scheduled. That is not to say that she denied players water. She encouraged players to drink water whenever they wanted at practice, but the formal period of a practice where everything stops for players to hydrate was not done. To me this is brilliant. Momentum and intensity are often lost transitioning from one drill to the next. If two teammates are watching ten teammates play, there’s no reason those two cannot get their water break in that moment and sub back in for two other teammates to get their water break. From an analytics standpoint, she enjoyed charting information and posting it in the locker room. Often times it was uncommon stats that came in a basketball game, but it could even deal with off-court values such as doing well on a test or community service. This was the fourth coach that I have at a formal sit down with this off-season. Each time I have been amazed at the coach’s willingness to do more than what I would have anticipated. Coach Helen dove deep into her bag of tricks and gave me several scouting reports, post offense packets from Pete Newell, and a variety of ideas for making practices competitive. I will dive into these items and dedicate a future write up to what nuggets I find beneficial.